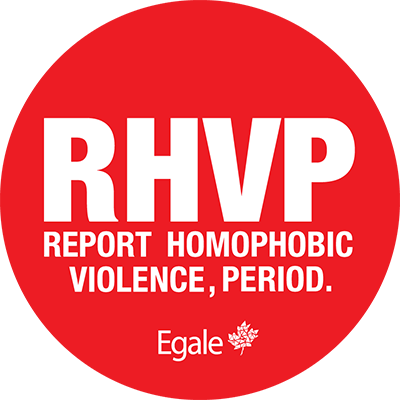 The Report Homophobic Violence, Period (RHVP) program is an initiative of the Toronto Police Service’s (TPS) LGBT Community Consultative Committee (CCC), and was developed in partnership with 21 different agencies, community service providers and community organizations. 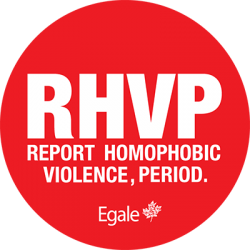 Today, the RHVP program has over 70 community partner organizations across Canada, and Egale Canada serves as the national and international dissemination partner, delivering training and materials. The program engages victims of hate crimes, police services, and the broader community with the goal of improving the lives of victims who have been affected by hate crimes, reducing hate-based victimization for the entire community, and building a safer atmosphere where victims of hate crimes have confidence that police will investigate their concerns thoroughly while treating them with respect and understanding.